Farzin Farokhzadeh is a family and cosmetic dentist based in the Bronx NYC. Dr. Farokhzadeh attended the State University of New York, Stony Brook, where he received his dental degree. Dr. Farokhzadeh runs his own dental center in the Bronx. Patients see dentist Farokhzadeh for a variety of reasons, including dental braces consultations, bridges, dental crowns, fillings, and dentures. Dr. Farokhzadeh is a member of The Empire Aligners. He is a best rated cosmetic dentist, a winner of the 2017 Galler Cup and he was awarded as the Top Invisalign General Dentist in North America. He is a member of The American Academy of Clear Aligners. He is dedicated to providing you with the best that dentistry has to offer and is continually educating the team on the newest dental techniques and approaches. 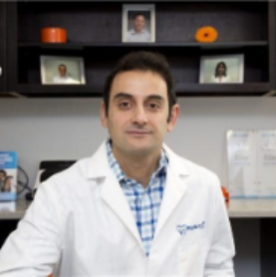 Dr. Farokhzadeh was named as one of the top cosmetic, implant and family dentists of America in 2014 and 2017, and was awarded as an Invisalign premier provider in 2017. Dr. Farokhzadeh believes in listening to each patient and creating a partnership to maintain and improve lifelong health. During his consultations, he explains patients’ conditions and helps them choose an appropriate dental treatment plan. Payment: Discover, Visa, Invoice, MasterCard, Check, Cash, Financing, American Express. 505 Dental Associates 505 Claremont Parkway, Bronx, NY 10457 +1 (718) 299-3600 https://www.bronx-ny-dentist.com Working Hours: Monday: 9:00 am - 5:00 pm Tuesday: 9:00 am - 8:00 pm Wednesday: 9:00 am - 8:00 pm Thursday: 9:00 am - 8:00 pm Friday: 9:00 am - 5:00 pm Saturday: 8:00 am - 3:00 pm Sunday:CLOSED. HealthCosmos selection of professional & user submitted videos answers important health questions. Enter Farzin Farokhzadeh's page for info and videos.